WEDNESDAY April 3, 2019 GoTAFE Harder Auditorium Fryers St. Shepparton. Arrive at 6.30pm for a 7.00pm start. Contact Leading Senior Constable Glenn Gibson (03) 5820 5830 or Senior Constable Dean Lloyd (03) 5820 5870. Proudly supported by 95.3 Triple M and Southern Cross Austereo. 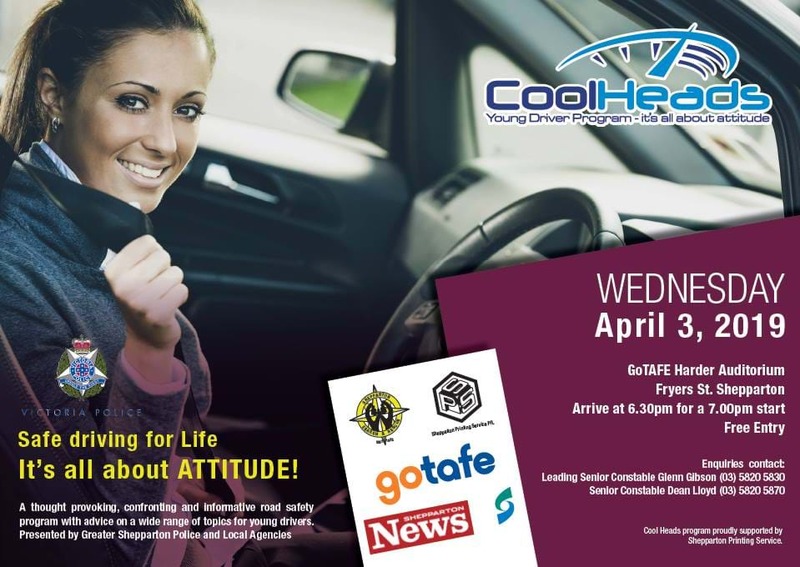 The ‘Cool Heads’ program is more than just a road safety message, it is an opportunity for young drivers and parents to understand fully the consequences associated with road trauma and to discuss safe driving with police and guest presenters. CLICK HERE for more from GSCC. Shepparton Victoria Police, Greater Shepparton City Council and local agencies have been working together to educate young drivers with a free interactive education program, Cool Heads, since April 2008. The Cool Heads program is more than just a road safety message, it is an opportunity for young drivers and parents to understand fully the consequences associated with road trauma and to discuss safe driving with police and guest presenters. The program aims to educate young and inexperienced drivers of the consequences of risky and dangerous behaviour when driving a motor vehicle. Cool Heads is a realistic, interactive and confronting program which reinforces that every risk taken on the road, whether small or big, can have extremely serious results. The program has been very successful attracting attendance in excess of 100 participants to many of the sessions with Cool Heads also being used by the Court as a means of raising awareness of young driving offenders to the consequences of their actions. Program evaluations illustrate that the program is very popular amongst attendees, and highly relevant to their needs. There is no cost to attend Cool Heads and the program is open to anyone from the community and court system aged 16 years and up. A certificate of attendance is also available if required. If you would like more information please contact the Shepparton Police Station on 03 5820 5777. It is hoped that through the ongoing operation of the Cool Heads program, many young lives will be saved on our roads.